I know, I didn’t blog last Thursday when the day was full of things I loved, sorry! Things were also crazy what with getting everything ready for the Graduation Extravaganza. Riff Trax live Christmas show: so funny! 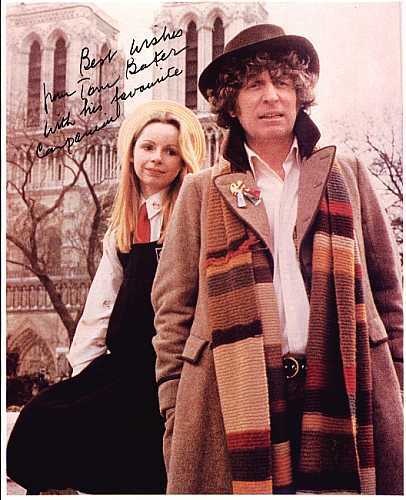 We could not stop laughing and one of the guys (Bill Corbett I think) was wearing a Tom Baker tie! Sneak previews of movies: The library sometimes gets free passes to sneak previews of movies. Usually the theaters are on the way other side of Houston, but last week they were showing It’s Complicated at the theater near us so I took my mom! The movie was cute and really funny though it felt a bit long. 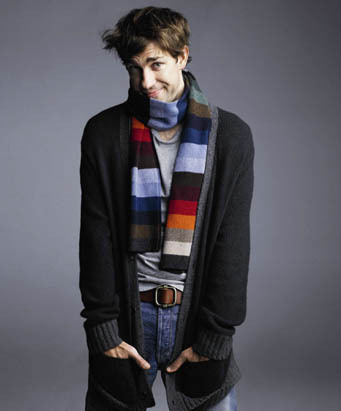 There were some awesome one-liners and John Krasinski was utterly adorable in his smallish role. My biggest problem was that no one wore colors! I get that it’s set it California and all, but don’t rich Californians wear anything besides white, tan, beige and charcoal? Blah, they were like oatmeal people! Having my sisters home: Robin came home on Friday afternoon and Katie got in early early Saturday morning. I love that Katie came and crawled into bed with me when she woke up and that we both ‘patted’ Robin to make her feel better because she had an earache. Partying! 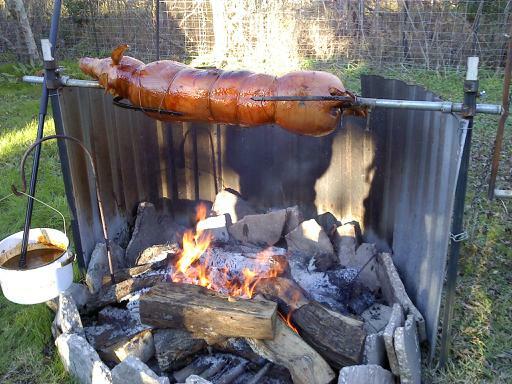 My big party was Saturday night, we actually did roast a pig and lots of my favorite people came and got to meet each other. The only downside to hosting a party full of people you know and love is that you can’t talk to everyone the whole time! And it’s very difficult to divide your time equally between them all. But everyone understood and I think we all had a lovely time, especially since I didn’t get to bed till 4:30am! Creative kids: I know I’ve probably bragged about Michaela who can knit or crochet anything, well she made me a Christmas present, a scarf with braille writing knitted into it! 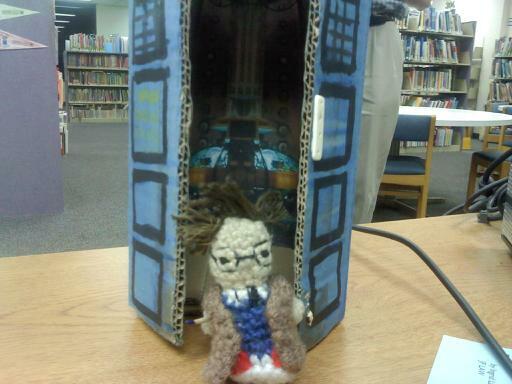 It says “Sti’s Scarf” Aaaand she made me a tiny 10th Doctor! And once she saw it, another one of my kids Merritt decided she was going to make me a Tardis and Sonic Screwdriver to go with him! We even made the interior! 🙂 She brought it in yesterday and another awesome kid Shalini made me a graduation cake! Love them! Love this job. Seeing old friends: Nick and Jessica are back in town for Christmas, they were able to come to the party (as well as Holly and Jeremy which was a really nice surprise!) and we all got together at Nick’s mom’s place last night. It was like old times, only now some of are married and have babies…also no arms were broken! Finishing Defensive Driving: early this fall I got a speeding ticket (my first ever!) and I’ve been putting off the defensive driving because of work and other stuff but now I’ve buckled down and gotten it done and what a load off my mind! Things I’m not a huge fan of, but don’t hate (because that would be stupid): people going out of town when I have time off, having too many good books to choose from!, nosy officers of the peace, being inside when the weather is nice. Sorry for the extremely long post! That’s right, I turned in my last assignment (Library of Congress Classification if you were wondering) yesterday shortly before 6:00. Now, assuming nothing horrific happens to all of the other assignments I’ve turned Friday is the Commencement Day at UNT and I’ll technically be graduated. Now, I won’t be there, but I’ll be having a party the next day at my house to celebrate anyway and in a few weeks my diploma should arrive in the mail. pack and move! 31 days till I move! Read and nominate graphic novels for the Maverick list! So there are lots of things I’m really excited about doing more often and I’m soooo glad to be done with school FOREVER (when I say that everyone responds, until you get your doctorate, at which point I vomit hyperventilate a little). I really wish there were more things for me to share right now, but I can’t think of them and I have another list of things I need to do here at work so I’ll sign off for now. See you on Thursday! Hey it’s been a while since I’ve done a TILT blog entry! This morning I wrote down a list of things and now I’ve lost it! Being done with my cataloging paper!!!!! Before I leave you to go an Outreach (storytime), here are some pictures. You can just barely see the monster puddle we have to tiptoe around! Okay, off to read winter stories! Since Becky is documenting her ‘snow-mageddon’ (great name by the way!) and wants to live vicariously through Texas weather, I figured I better get started! It’s true, I have worn shorts on Christmas Eve before, granted it was in junior high, but I did! 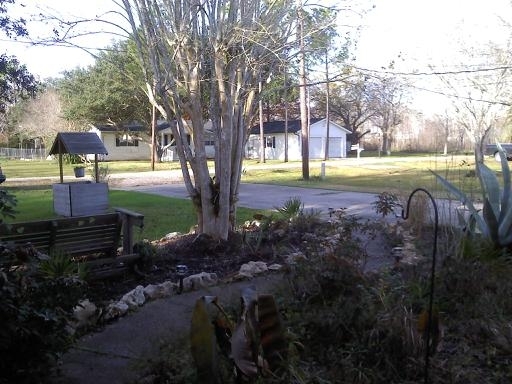 Not that winter in Texas is all palm trees and icy drinks with little umbrellas and cabana boys. Today it stopped raining for the first time in a couple days! I was really excited about this since my windshield wipers are being ridiculous and it’s dark when I get off work and blah blah blah, they’re only partially operational at the moment. 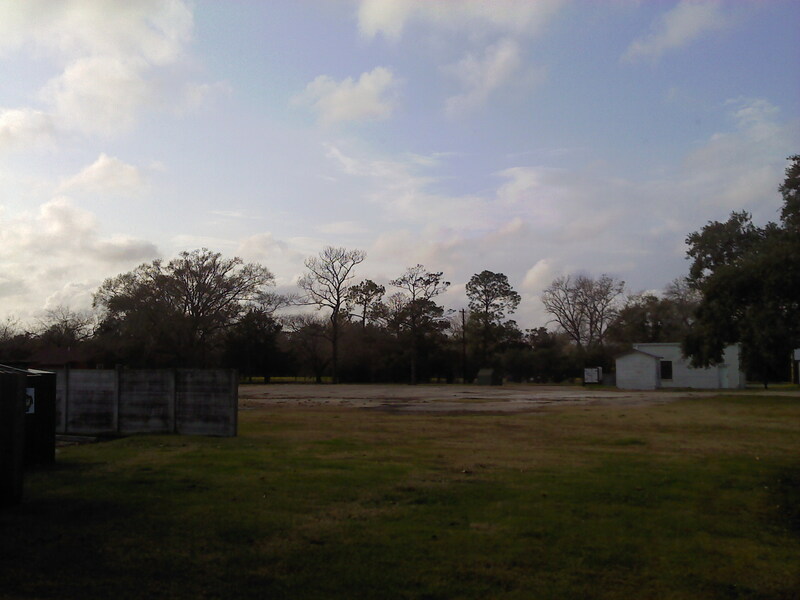 So no rain is a great thing, however our yard looks like a swamp and we’re hoping it’ll dry quickly so we can party on it next next weekend. It did snow here last week though! 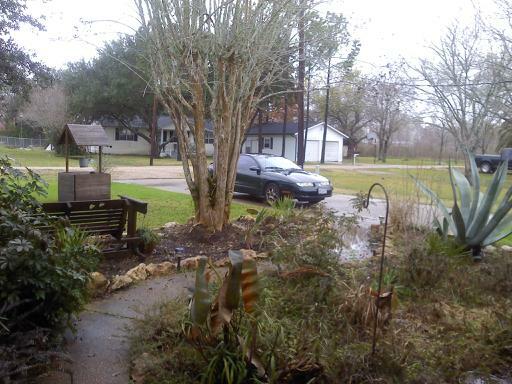 The earliest recorded snow in Houston EVER. And they were genuine fat flakes, that mostly melted when they hit the ground, but still it was fantastic!